Hello. Is there anyone still out there? I’ve been away a little bit longer than intended, first a week’s holiday and then another week to adjust to being in the real, cold, wet, windy world again. Our trip to Florida had highlights and some not so high lights and I’ll try to share some of the really good things soon. However, today could not pass without mention. Today is my Father-in-law’s birthday, and, more importantly, the day on which he received his inaugural pair of hand knitted socks (by request). After holding out for many months he finally cracked and indicated wistful glances towards H’s numerous pairs (H has given up on non-handknitted socks apart from sport). So, what yarn should you choose for the man who has everything? A man still on holiday in Florida as we speak? It can only be the star spangled banner. We called at lunchtime our time today and they are officially a hit. He was planning to wear them on the golf course this afternoon. 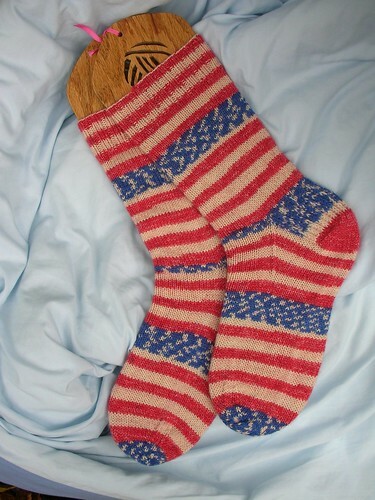 If anyone else fancies being, well not quite patriotic, but certainly quirky, the yarn is Scholler & Stahl Socka Color in 1776 (I can’t believe that joke’s only just hit me) and it came from Web of Wool.